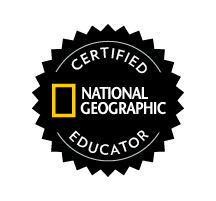 I feel so privileged and honoured to have been featured in National Geographic Education’s Educator Spotlight series for the second time this year. This time around, I was interviewed about my class’ partnership with the StopGap Foundation, which you might have already read about. You can read the interview below, or check it out on the NatGeoEd blog! You’ve said that you like to think of yourself as a “teacher researcher.” What do you mean by that? Before I was a teacher, I was an academic, and that was my first love. In graduate school, we talked a lot about the role of a teacher researcher. That just means that teachers can and should be continually learning and reflecting on their teaching practice based on what’s going on in their classroom. So for example, I’ve gotten into the habit of documenting my students’ learning really thoroughly by taking photos and video, recording student voices, and taking hand notes on what my students say in class. This helps me measure the efficacy of my teaching practice and adjust accordingly. How did your recent project about community accessibility come about? There had recently been a big athletic competition held in Toronto for athletes with disabilities—the Parapan Am Games—and I was really inspired by how excited our city was about the event. Meanwhile, I was thinking about how to start the school year, and I always like to begin with community building in the classroom. The big idea that I wanted to emphasize was that we all have contributions that we can make to our classroom community and we all have things we individually struggle with. So at the very start of the year, we did some read-alouds that were on the topic of accessibility. The stories had characters who might typically be perceived of as having a disability. Then we did a character study where we thought about and listed the character’s strengths and struggles—the things the character was really good at and the things they needed help with. By the end of September, the students had gotten in the habit of reflecting on their own strengths and struggles. And once I started reaching out to families to tell them about our study of disability, connections came out of the woodwork. One of my student’s parents is an American Sign Language interpreter so she arranged a community member who was deaf to come in and talk the students about what that’s like. Another parent was an architect and spoke to the class about the ways architects tackle accessibility. And how did the accessibility study culminate in a service learning project? Well, we go on weekly community walks where we observe things about our local area. This particular time, we decided to focus on the structures, features, and services that the architect had told us about. We were looking for things like beeping sidewalk signs, public transit vehicles that lower close to the ground, and bumps along the sidewalk that allow people using mobility canes to feel where the sidewalk ends. Students collected data by making tally marks for how many features or barriers they saw. We walked by a wooden ramp with the words “stopgap” on it. I had heard of the Stopgap Foundation—which builds and sells low-cost ramps for single-step storefronts—and hoped my students would discover their impact around the city. They were very interested and wanted to look at the website together. We watched a video of the organization’s founder, Luke Anderson, and the kids asked if they could meet him. So we emailed him together. Once we heard back from Luke, we set up a time for him to come in and speak to the class. Then, we discussed as a group what kind of action we could take to improve accessibility in our community. It all just spiraled from there. The students decided they wanted to sell stopgap ramps to local businesses so we started measuring for the ramps in math class, wrote our pitch script in English class, and practiced our delivery in drama class. So you made a plan for which storefronts to visit, and then your first graders actually approached the businesses themselves? Yes! They always went in buddies, and I was able to recruit student teachers, parents, and other volunteers to help out. Beforehand, we discussed what people might say, why they might say no, and what we would say to counteract their reasoning. We were also very open about the persuasive power of kids, so the students knew their age could be an asset in some ways. I was impressed that the students latched on to the idea that accessibility is not only beneficial from a human rights or social justice standpoint. It’s also beneficial in very concrete, tangible ways economically. Businesses make more money when more people are able to access them. My students figured out that the ramp only costs $100, which was tiny compared to the possible increase in profits from new customers. I think that particular argument made them really persuasive. Do you have tips for tackling issues of social justice or inequality with younger students—particularly for teachers who haven’t tried that before? What I found is that accessibility was a really developmentally appropriate social justice issue for first graders because it’s very visible and very concrete. When we were on a community walk with Luke, the students could see that he couldn’t get into a bakery they liked. They felt it wasn’t fair that he couldn’t go. Once they have a solid grasp of this concrete, visible form of injustice, they’ll be able to apply it to other forms of injustice that are less visible. Educators may also worry that they’ll be accused of indoctrination or something like that. I think the way you present information to students makes a big difference. It’s important to do this kind of learning through an inquiry-based lens where it’s following a student interest. You might ask questions, but let children come up with their own answers to those questions. That will sound very different when the student talks about it at the dinner table at home. And finally, make sure the issue you tackle is relevant to your own community. Stopgap is a local Toronto organization. Now, whenever my students walk by a café that installed a ramp, they’ll be able to say their class did that.